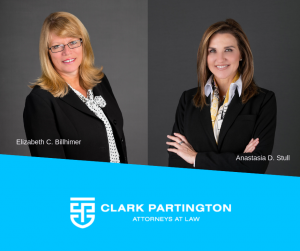 PENSACOLA, March 26, 2019 – Clark Partington is pleased to announce that two of its attorneys, Elizabeth C. Billhimer, and Anastasia D. Stull, will attend the Consumer Bankers Association’s Annual Meeting, CBA LIVE, on April 1 – 3. This event will celebrate 100 years of the Consumer Bankers Association and host more than 1,500 senior bankers and industry leaders from across the country. CBA LIVE offers top-notch programming tailored toward professionals motivated to learn new banking trends and share ideas with decision makers in the business. This year’s speakers will include industry leaders such as Chase’s Thasunda Brown Duckett, Bank of America’s Brian Moynihan, and PNC’s Todd Barnhart, as well as top regulators including OCC Comptroller Joseph Otting and FDIC Chairman Jelena McWilliams. Anatasia D. Stull: Anastasia (“Tasia”) Davis Stull joined Clark Partington’s transactional practice group after spending almost two decades in Washington, DC, New York, NY and London practicing in the area of financial services. Her practice focuses on financial institution consumer regulatory risk and compliance, business formation and transactions, corporate governance, and matters involving medical marijuana. Throughout her career, Tasia represented individual and corporate clients in a wide range of industries including domestic and foreign banking, mortgage lending, and securities. Tasia has practiced in front of the Federal Reserve, OCC, CFPB, SEC, FDIC, state financial regulators and attorneys generals and in a variety of matters involving investigations and enforcement, complex litigation, regulatory examinations and compliance reviews. Elizabeth C. Billhimer: Elizabeth joined the firm’s commercial litigation group in early 2016 after practicing in Washington, D.C. for more than a decade. Elizabeth is a native of Niceville, Florida and has returned home to bring the benefits of her D.C. experience to serve the legal needs of our local and regional community. Elizabeth has extensive experience handling complex legal matters. In D.C., her practice focused on general litigation matters, including representing companies and individuals in civil and criminal government enforcement actions, bid and grant protests in administrative and judicial forums, and conducting corporate internal investigations, compliance reviews and risk assessments. Elizabeth has represented corporate clients in a variety of industries, including oil and oil services, pharmaceutical, automotive, advertising, and technology. Elizabeth has performed numerous Foreign Corrupt Practices Act investigations on behalf of multinational clients with issues in numerous countries, including China, Iraq, Brazil, Indonesia, Mexico, Angola, Romania, Austria, Kazakhstan, Kuwait, and Nigeria. Elizabeth also has assisted companies in enhancing compliance programs to address anti-corruption and anti-bribery requirements. Clark Partington is the largest business focused firm in the Florida panhandle with offices in Pensacola, Destin, Grayton Beach and Tallahassee. The firm also maintains a presence in South Alabama with an Orange Beach office. Since 1976 Clark Partington has grown to over forty lawyers and has served the people and businesses of Florida through an innovative and collaborative approach to practicing law. Our lawyers are consistently recognized for their service to the profession and excellence in the courtroom. More information about the firm’s practice, its attorneys, and recognitions may be found at www.clarkpartington.com.